I just love this cover. I’m not sure but I’m betting the idea for this cleverly casual and whimsical cover was writer Robert Kirkman’s. I know he lays out thumbnail sketches for most of the Walking Dead covers so I’m betting this was his too. If anyone knows please feel free to post below in the comment section! 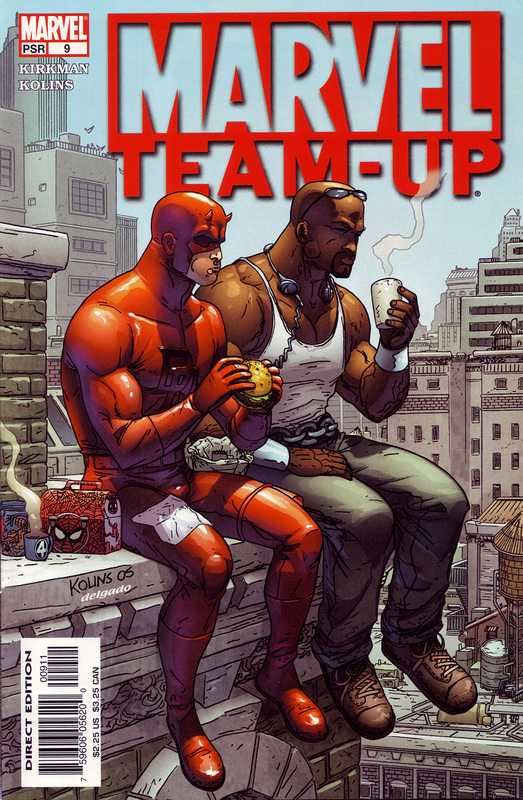 I really liked the title logo for this -the third volume of Marvel Team-Up. And this cover is probably the best in this series. Just two buddies having lunch. The Spider-Man lunchbox and Fantastic Four thermos are nice touches. Stop by tomorrow night for issue #92 in this count-down of my Top 100 favorite covers. This is a great cover. It’s got a real sense of fun and humour.